Hi there, my darlings!! After a BRUTAL winter, I'm so ready for warmer temperatures and the beginning of summer, as I'm sure all of you are! I definitely associate summer with super bright colors, eye-catching manicures and pretty pedicures--so looking forward to open-toed sandals and flip-flops! 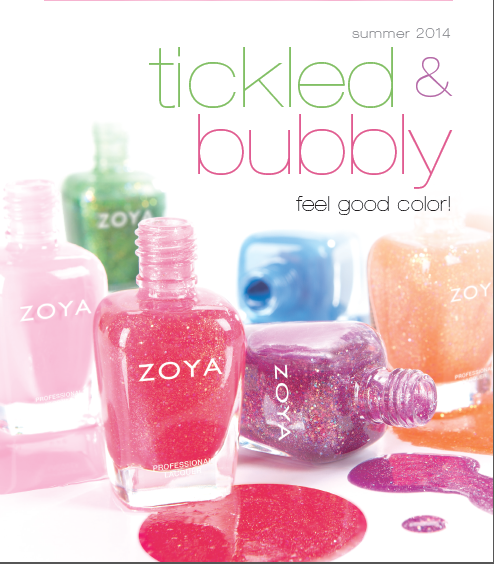 Today, I'm so excited to show you a closer look at what the fairies of Zoya Nail Polish and Treatments has in store for us--the gorgeous Tickled and Bubbly collections for Summer 2014! The Tickled collection consists of 6 highly pigmented, full coverage cremes that are perfect for Summer! At first glance, I'm really loving Rooney and Ling! The Bubbly collection consists of 6 sparkly shades full of shimmering holographic particles! WOWZA! I had a hard time picking a favorite here because I want them ALL but I'm particularly loving Harper, Binx and Muse! Guess what, my darlings! 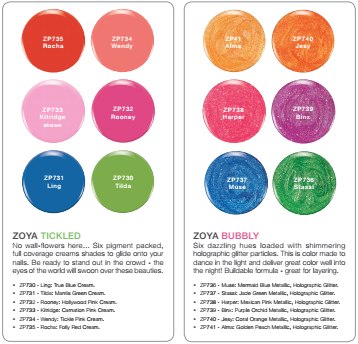 These beauties are available for pre-order RIGHT NOW on Zoya's website for the price of $9 a bottle or $54 for a 6-pack sampler! Shipping is scheduled to begin in early May. So hurry on over and grab your favorites! 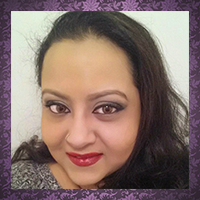 Stay tuned for some more exciting news courtesy of Zoya tomorrow!